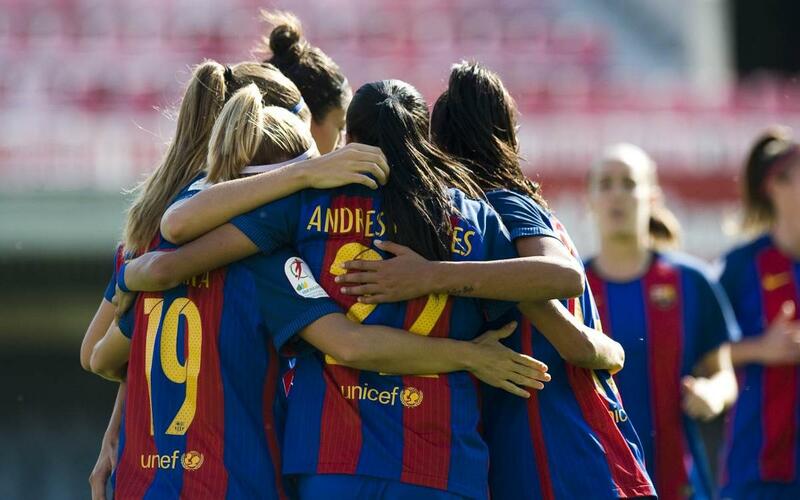 The FC Barcelona women’s team capped a wonderful in week in which they confirmed qualification for the last sixteen of the UEFA Champions League with a mighty seven-goal rout of struggling Fundación Albacete on Saturday morning. Barça dominated from the start and Olga García had already had two fine chances before she finally found the net after 19 minutes. The deadlock broken, the goals started flowing. Olga added a second straight from the restart and no sooner was the ball back in motion than Sandra Hernández had made it three. There was no let-off as Barça continued their relentless onslaught on the Albacete goal, and on the stroke of half-time Olga completed her hat-trick. With a four-goal cushion, the second half was little more than a formality, and that was even more the case after Alexis Putellas had made it five on 62 minutes. That was her first intervention since coming as a substitute. It didn’t take long for Jenni Hermoso to join the party … twice … first from the penalty spot and then again from open play. The win maintains the only remaining 100 per cent record in La Liga, and with 26 goals for and none conceded, the season is shaping up very strongly indeed for Xavi Llorens and his team.